It's Hip Hop Hangover Friday! This is a card I made yesterday for the I Heart Unity challenge. 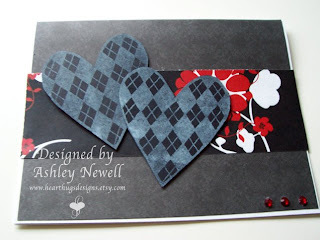 The challenge was to make a love card using Unity Stamps. This actually matches the altered album I'm making my hubby for Valentine's Day which I will be back on Sunday to show. I used Unity's Argyle Heart on this card. I think it's a nice mix of hearts and something a little more masculine. The background paper is DCWV and the accent paper is Cherry Arte. Then I put on some rhinestones because I just couldn't resist. Hope you all have a wonderful Valentine's Day! Tomorrow, I will still be posting the EtsyInspired challenge. How cute is this!! Love it and so fun to see non-traditional colors, I seem to get stuck with reds and pinks!! These hearts are definitely perfect for a masculine card. Very nice! What a fab card!! Those argyle hearts are so cute@! ooo Ashley this is sooo pretty! :) Love the colors! How pretty & elegant. I can see my DH loving this card as it's not too girly for him. Love your use of colors! That is sooo cool Ashley!! I love the Argyle hearts in the black color!!! I love this stamp! pretty! Ashley super cute card!!! Happy Valentines' Day to you! Great valentine for a guy! I seem to do so many "girly" cards. Thanks for the inspiration. I love the argyle hearts. Very nice card. This is really cute!! Love the colors!